As negative as I am, even I am sick of writing entries of doom and gloom and am scrambling to find anything positive of note. I'd take this story from FT.com as a positive... granted the prices being offered are pennies on the dollar but I expect some fortunes to be made on the upside because if you can buy at 6 cents on the dollar and sell at 27 cents on the dollar in 3 years, well you've done good. John Paulson, the hedge fund manager who was called before Congress last week to discuss the big profits he made by foreseeing the collapse of the subprime mortgage market, has started to buy securities backed by residential mortgages. Mr Paulson’s move marks the latest example of a famously bearish investor shifting gears to profit from depressed prices in the global credit markets. 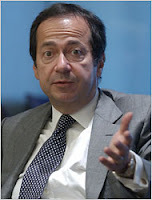 According to Alpha Magazine, Mr Paulson made $3.7bn in 2007, reflecting the success of his strategy – begun in 2006 – of betting on a collapse of the subprime mortgage market. At the end of the third quarter of this year, his funds were up 15-25 per cent. His funds also made profits in October, his investors say. He signalled a potential new direction on October 1 by launching his Paulson Recovery Fund, which will take equity stakes in financial institutions. He also has moved to start a real estate fund. However, Mr Paulson has been careful to avoid moving into distressed markets too early. For example, he refused in April when approached to invest alongside TPG in Washington Mutual. The debt and equity of WaMu was wiped out when it was taken over by JPMorgan in September. Mr. Paulson was one of the 5 hedge fund managers called to testify to Congress last week - it was interesting to see how they were treated with kid gloves. Maybe the super charging of political contributions by hedge funds the past few years has something to do with it... nah, that would be cynical. A House of Representatives committee room was transformed into a club for billionaires for a few hours on Thursday, as five of the richest men in the world testified on the role of hedge funds in financial markets. But aside from some grumblings about how much money hedge fund managers make, the sharpest remarks were directed not at John Paulson and the other hedge fund billionaires, but at Henry M. Paulson Jr., the secretary of the Treasury. All five managers — Philip A. Falcone, Kenneth C. Griffin, John A. Paulson, James Simons and George Soros — said they would support new rules that would require their industry, controlling nearly $2 trillion, to disclose more of its secrets. More than a year into the financial crisis, the hedge fund industry’s leaders seem to realize that regulation may be inevitable, that operating under the radar may no longer be possible, and that their riches have torn away their cloak of anonymity.